It’s early morning and the sun has not even bothered to show yet and you are not even sure that you are awake! Leaning over to get the toilet paper and you realise there is none, nor is there any in hand reach …..so there you are finally realising that you have to sort out your bathroom organisation coz this can’t happen again. 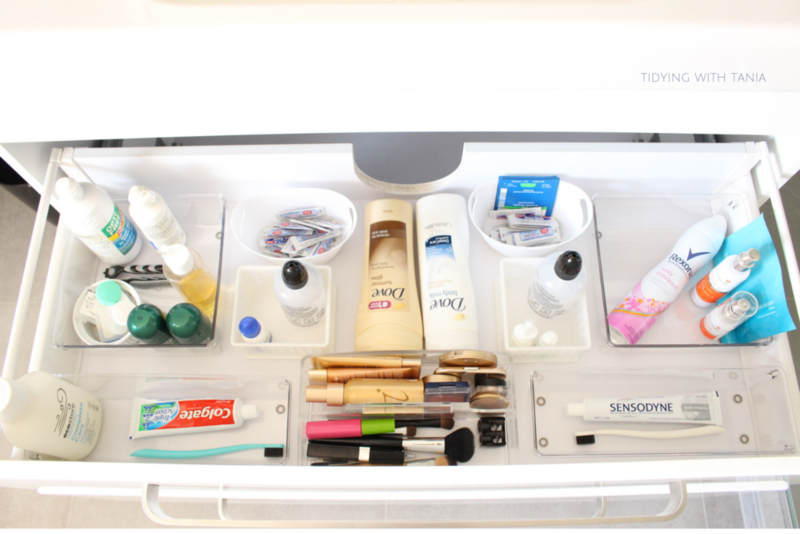 You have also gotten sick of hunting through all the junk in the drawers to find toothpaste that’s not empty….and what about your make up…..is it a complete riot? It’s time to get your bathroom drawers and cabinets into ship shape, so if that is you then this post is perfect. I’ll take you , step by step, through how to go from chaos to calm and have functional and beautifully organised drawers and cabinets. So lets get into it. Empty containers -old storage boxes, bowls/ice cream containers whatever that you have lying around. Just to give you a sense of what we are tackling, here are the before pics of both my bathroom drawers. First rule of organising is to start with a clear space. Empty out everything from all your drawers. Please don’t miss this step as you will end up in a mess again, take it from me , I’ve learnt from experience. 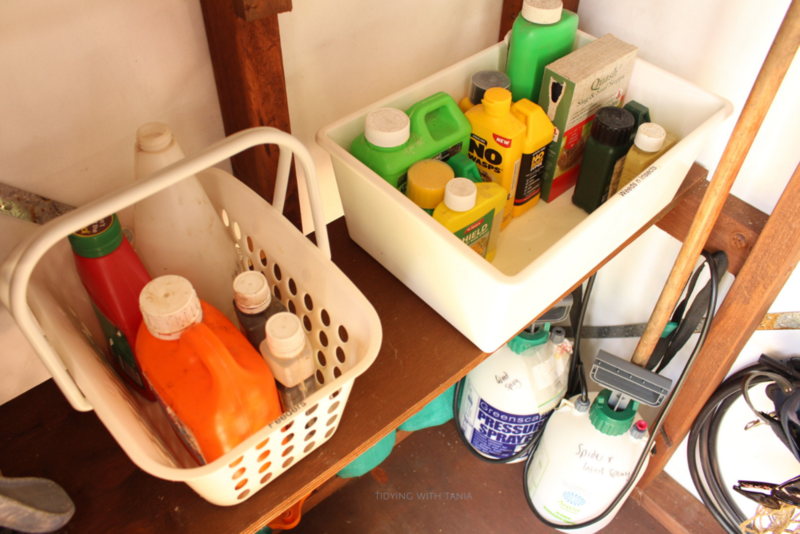 But before you just simply throw everything onto the floor and bench top STOP , go and get your self some containers , these will be used for sorting you things into categories. The plan for the containers is to place like items together, i.e you are categorising as you go, this makes life a lot easier when it comes to working out how you want things organised when you place things back into the drawers. I just used these storage boxes that I had in the linen cupboard unused. They are actually great to have on hand as they easily fold up and store away. Now that you have everything out, give the inside of the drawers a good clean out. I just used my trusty general cleaner and the paste for hard to shift dirt. If you want to get the recipes for my cleaners just complete the form below to receive it straight into your inbox. 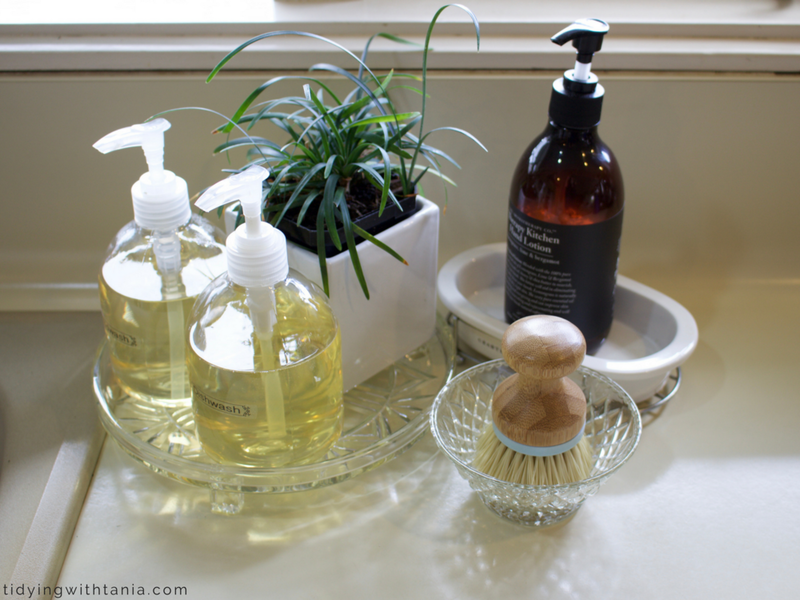 Also you can check out my post on my DIY cleaning products. 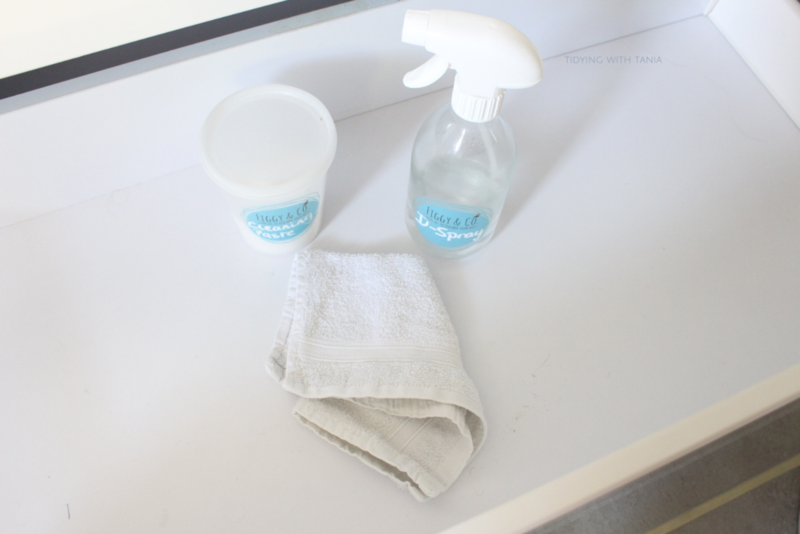 These products that I have here are actually from Figgy & Co , they have great DIY kits so you can easily get started with your first home made cleaning kit. Now that you have everything all cleaned and shinny it’s time to have fun planning out how you want to sort and organise everything. To illustrate the best approach to this I’ll just take you through how I worked through this for my drawers. 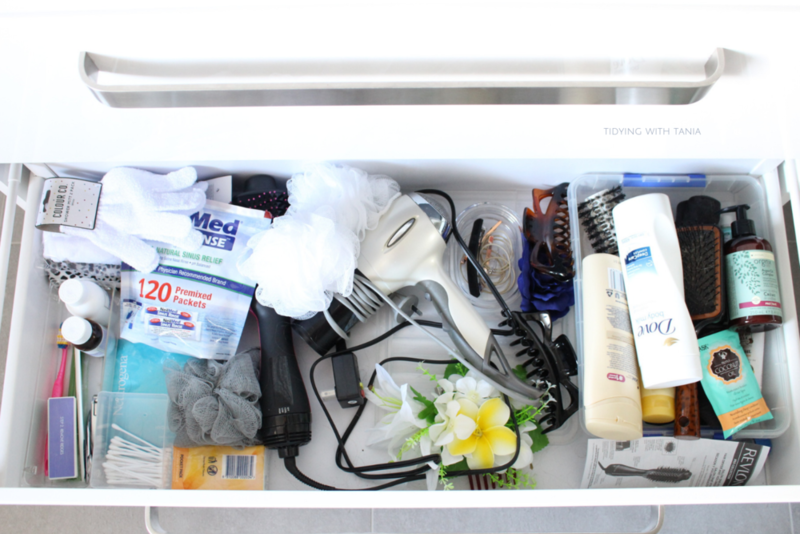 For me there were a couple of main things I wanted to improve in how things were organised in my drawers, being the toilet paper, my makeup, Pete’s stuff and my hair stuff. So the toilet paper needed to be sorted at end of the drawer closest to the loo. This meant that if I ever ran out while on the loo , I could just reach into the drawer and grab some more. My makeup needed to be in a more portable container as I take it out of the drawer everyday. In relation to Pete’s stuff, he needed his own section of the drawer so he knows which was his, and lastly my hair stuff just needed to be better contained and sorted out. I decided to keep the items in the same drawers they came from, so the top drawer to have all daily items and bottom one everything else, including supplies on hand. Then measuring the length and width of the drawers helps to work out what containers will fit in. At this point I also look at containers that I can reuse from around the house rather than buy new ones. If you are going to buy containers make sure that you know their measurements so they will fit into the drawers. Also make sure that all bathroom containers will need to be water proof and easy to clean. Apart from the practical aspects to the storage containers, you can really personalise a space with the type of colours and styles of the containers……so why not make it pretty. As an example get a nice pattern or colour drawer liner to place under clear containers. In my drawers I have just used a white non slip liner so the containers will not move around. Tip: secure the liners with Museum putty. It may take a few goes at getting the containers best placed, have a play around to see what works best. I often find that what I have planned out does not always work well so have to change it up a bit to get it right. Also think about other ways to contain your items. As an example, I am using make up bags to store my hand and nail products and hair accessories, as I often take these items out of the bathroom. So here we have it , the big reveal of both the drawers, all organized and sorted. The top drawer is now divided into two sides, one is for Pete and the other for me. So no more mixing up toothbrushes !!! eeewww. I have kept the spaces as clear as possible as this makes is more useful when getting things in and out everyday. In terms of a great find, my new makeup container has worked out perfectly. The problem that I had was that the old container was actually big and had no handle. Now I have a much smaller and lighter container, with a handle and it still fits everything in it. 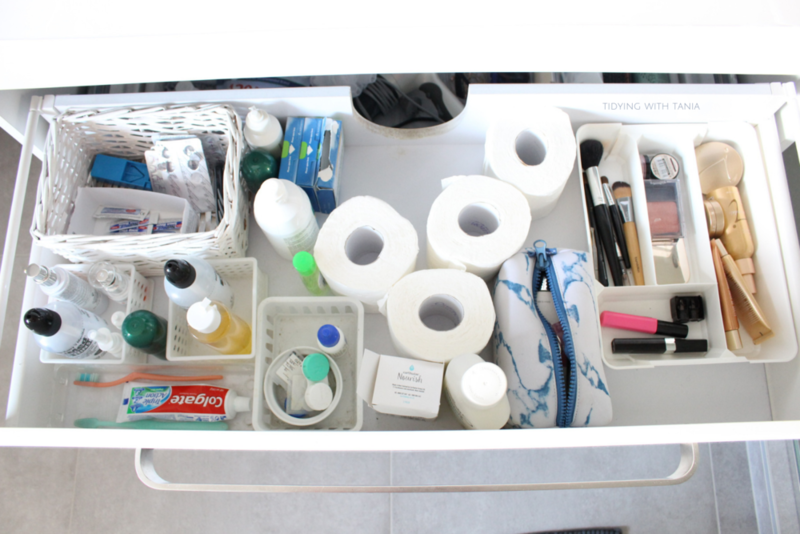 My bottom drawer, below now is a pleasure to open and I can reach the loo paper from the toilet seat!!! boom!!. I have to say I love the cosmetic cases that I used here, one has all my Manicure and Pedicure things and the other all my hair accessories and products. Having these in cases actually means that I can easliy take them in and out of the drawer and have everything I need in one container!! perfect for when you are sitting styling your hair in front of the bedroom mirror. Thats a wrap folks!!! 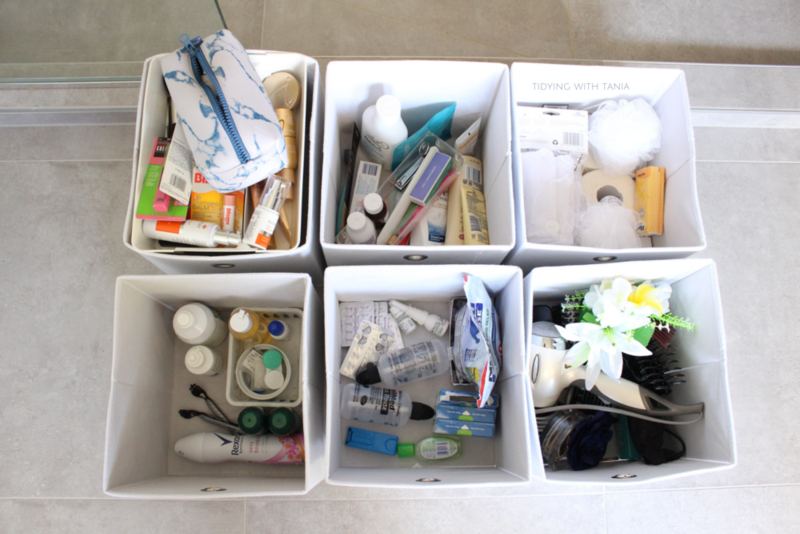 My bathroom drawers are sparkling clean, tidied, organized and decluttered…yip they bring me joy! So lets summarise what I have done and what would be the key take outs for you, to help get your drawers sorted and ready for spring or autum …..I’m not hemispherist! My most important comment here would be that these organising sessions do not have to take long and so don’t let the “overwhelm” get in your way- break each step down and do each of them then before you know it you too have finished the job. And handy hint , the more you do the better and faster you get! Well I hope that you found this little post useful and maybe even given you some inspiration. Tip 1 - like for like - as you go through the decluttering process , categorise like for like. Tip 3 - Reuse - don’t always buy new containers, shop you home first and try and use what you have at home. Saves money and the environment. Did you enjoy that post? 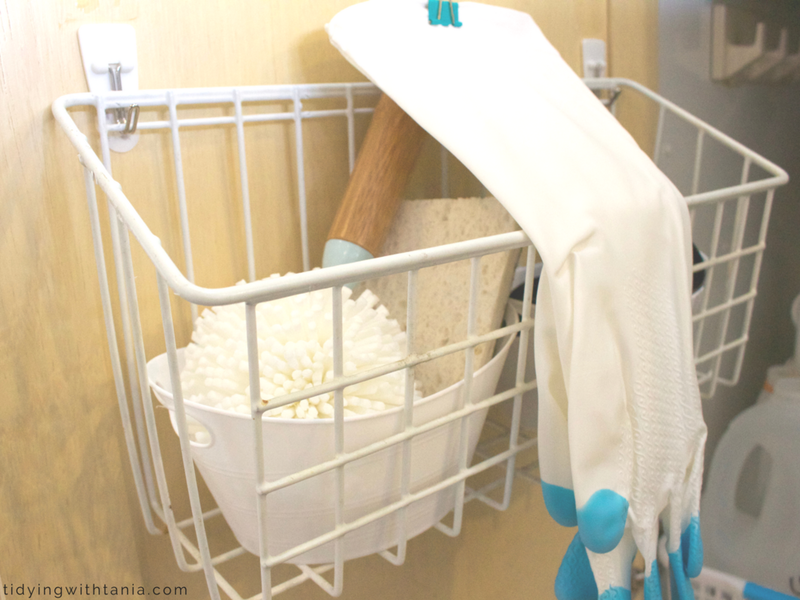 Want to get more organizing tips, ideas and inspiration? I had never thought much about having a garden shed, specially for me . 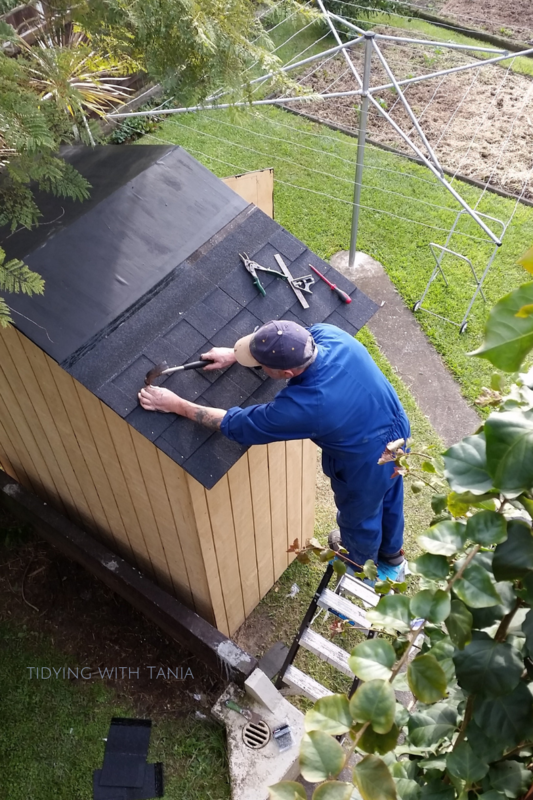 I suppose that growing up it was always the Dads that had garden sheds full of tools and things so I was conditioned to think that it was a “man thing” to have a shed. What started to make me re think this was a combination of my Pinterest addiction and sheer frustration of not having a proper home for my garden things. I was seeing these amazing “She Shed” trend as well as Pot Sheds in Pinterest. 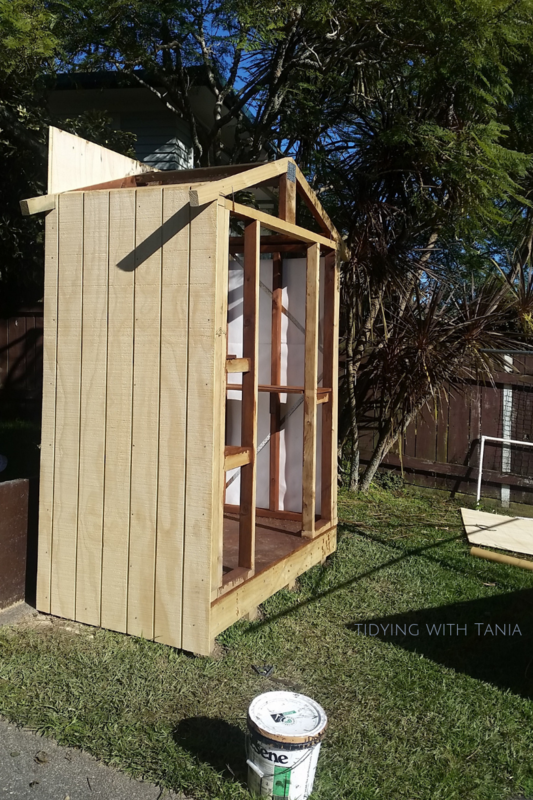 So I said to Pete….”Hey Babe do you think you could make me a wee garden shed?” “Sure thing” he said… Now I have an amazing shed and I totally love it. I love it so much that I thought I’d share how we (Pete) built it, and how I organised it. To figure out what sort of shed would be best, I needed to be clear on how I wanted to use it . 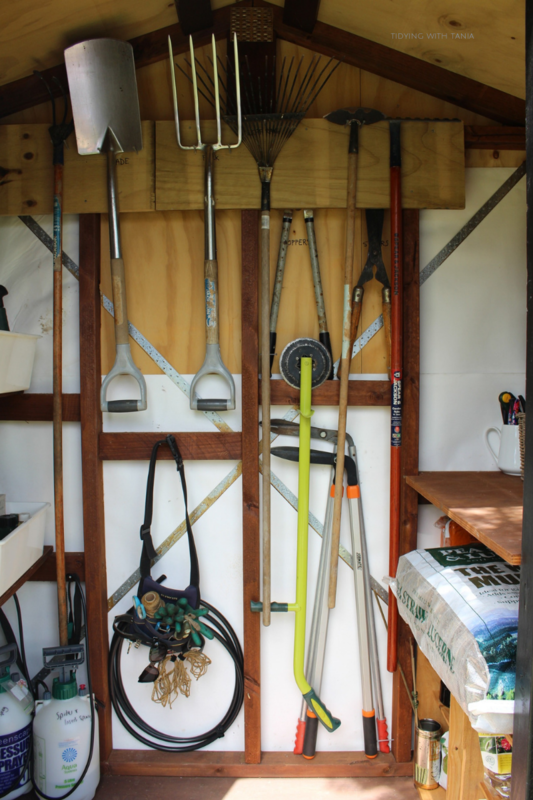 The purpose of the shed was to house all my garden things that I use, tools, pot, feed, sprays etc. Obviously it needed to be handy to the garden so I could access it easily. Additionally I needed the design to be one where I could open the shed and have everything at easy reach from the door. We had the perfect position for the Shed (albeit needing to get rid of a big old Daphne bush) which dictated the size of the shed . It could not be too large at all, which actually gave us the opportunity to get creative with the plans. Pete was is charge of the build and in some way the design too, I helped by checking out online Timber Sheds and came across these which were exactly what I wanted. Pete then took the basic design and worked out a plan for our Shed. Have you heard the term “over engineered”? well that’s how Pete described our shed…in short it’s the place I’m going if we have a tornado. The best way to show the build is in this pictorial and the explanations of each stage. Flooring down, Frame work up for the sides, wall lining and bracing in. Roof and tiling. We used Asphalt Shingle roofing tiles for the Shed. Now most of you know that there is actually alot more to it than those pictures show, so if you are interested in wanting more details on the building of the Shed, Pete has kindly documented out all the measurements and materials and I’ve developed it into a guide with plans on how to build the Shed. Now the fun begins! Build done and it’s my time to get my organising socks on! I had vision of drawing outlines of my garden tools onto the walls, yip that was a thing, back when I was a nipper, the neighbourhood Dads used to have their tools on the peg board wall at the end of their garage. They would have the shapes of the tools outlined on the peg board just in case they forgot which tool went where. I always thought it was a bit weird until I grew up and became an organising expert. 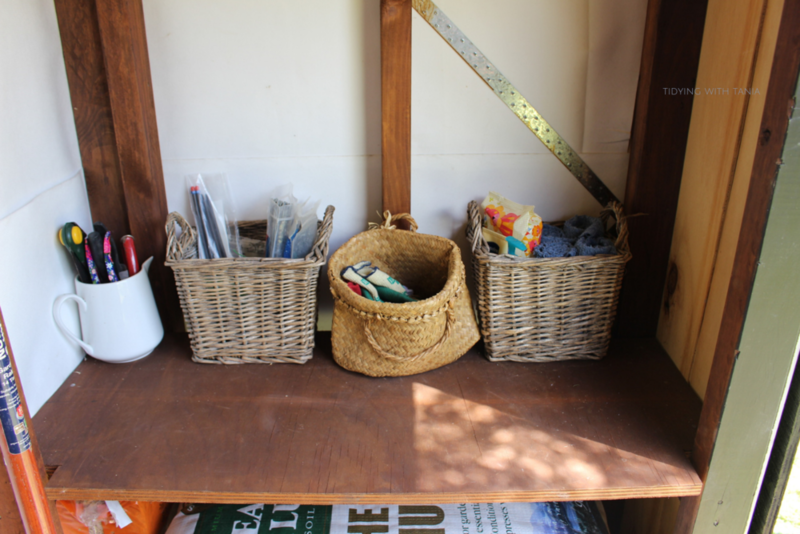 On both sides of the shed, Pete installed simple shelves, On these shelves I have my most common reached for items because it’s the easiest to access area in the Shed. All my garden feeders are corralled into a carry all basket so I can pick it up easily and take it outside. I tend to do all the “feeding” at the same time as I mix them with water into the feeding can (on old watering can). This is really helpful over the spring and summer season as you do need to feed regularly to have a healthy crop. ﻿On the other side are all my sprays, manly for insects and spiders and other wee creepies. Hint don’t spray into cobwebs directly above your head , you never know what might be waiting in hiding in the cobwebs. I do have to be careful not to muddle up weedkiller with Organic Oil spray so I make sure that I label everything, on lids and the sides. Under the shelves I have all my large spray containers that I use to disperse the sprays. These are again well labelled so I know not to put the wrong sprays into them. Also I have all my weed and pest control spray containers on one side and the liquid organic sprays on the other. I just put up nails which I then place the sprays guns on, so this keeps them well contained and the guns have somewhere to hang. You will notice in the photo that I have used the space in between the frame work for storage. These are awkward items to store, so I thought by just criss-crossing the wall with bungie cord I could manage to have these items stored vertically and not take up too much room. Never forget to use your vertical space if you are tight for room. ﻿On the other side of the shed I managed to create more shelving with these amazing boxes which I scored from Junk & Disorderly for only $12 each, a total find!!! One holds all my pot plants (indoor) stuff, pots and such like. In the other box are the soil and lawn fertilisers . Between the top of the boxes and the shelf there is the perfect space for the bag of pea-straw. I always a have a bag on hand and it’s the perfect spot. On top of the shelf I have a couple small baskets that once upon a time were plant baskets. I just use them for storage now. One I put my “hand cleaning” stuff in. Often when I am in the shed, I have very dirty hands from the garden so having hand wipes and disinfectant handy is great. I also have a pile of towels I use for two purposes, drying my hands and cleaning off my garden tools. In the other one I have some bits and pieces that I use in the garden, like garden ties etc. In the corner I use a old broken jug to store my pruning tools. Now a little awesome idea I had, has turned into my mini garden office!!! 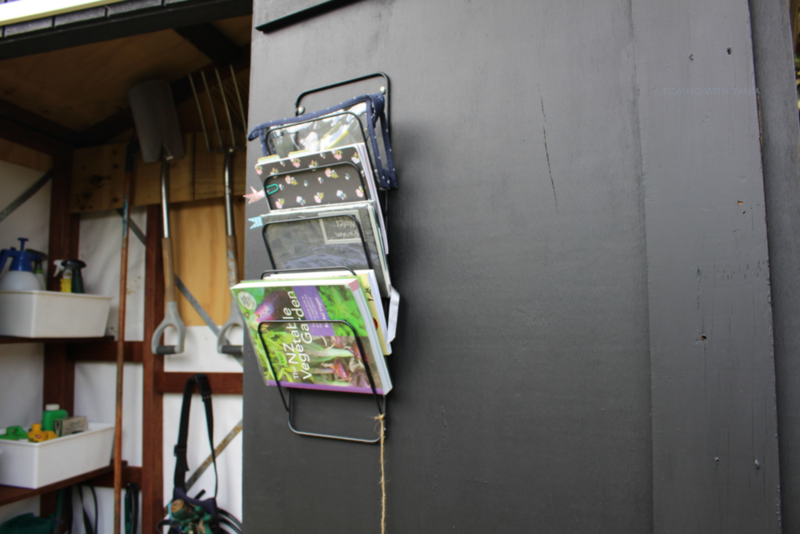 The back of the shed door was unused space so I painted it with black chalk paint, and along with a wall magazine rack which I scored at the local hospice shop for $4 , I now have all my books, garden diary and notes on hard. The blackboard is handy to write notes to myself, like when I’ve feed and sprayed and things I need to do next!!. This is great use of vertical space. Another wee genius ideas of mine was my garden toolkit. It was actually a spare tool kit Pete had (he’s a Tradie) which he wasn’t using. It just seemed to be the perfect size for me. I carry all my essentials in it so I always have these with me when in the garden. I just love it and it has a handy wee trick where you can slide the kit itself along the belt so when bending down it sits on my back and doesn’t get in the way. 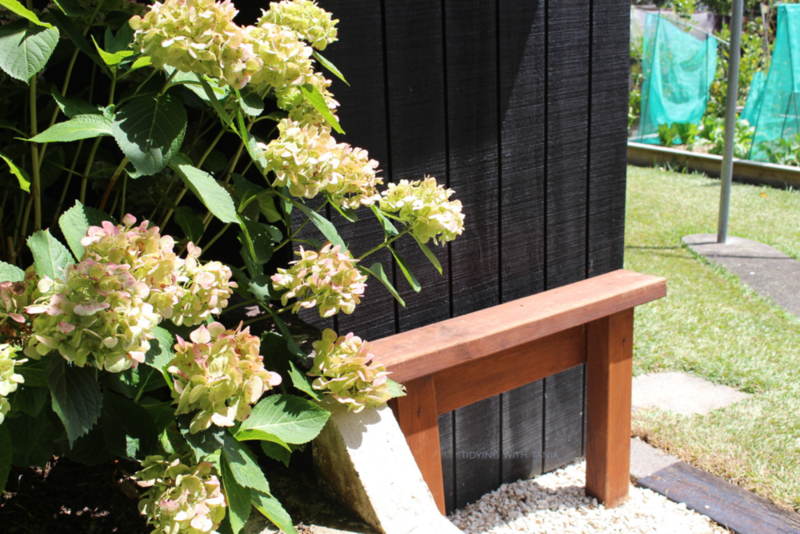 ﻿And finally the coolest thing of all , is this little seat on the side of my shed which Pete made for me, man he’s thoughtful. It’s where I sit and clean down all my tools at the end of my garden session. Yes I am one of those who looks after her garden tools, always making sure they are cleaned, sharpened and oiled. It is amazing how long things last when you look after them. My loppers, secateurs and hedge trimmers were given to Pete and I when we got our first house, which would be over 25 years ago! Having my own garden shed is fantastic and it’s such a great design and so practical , I just love it. 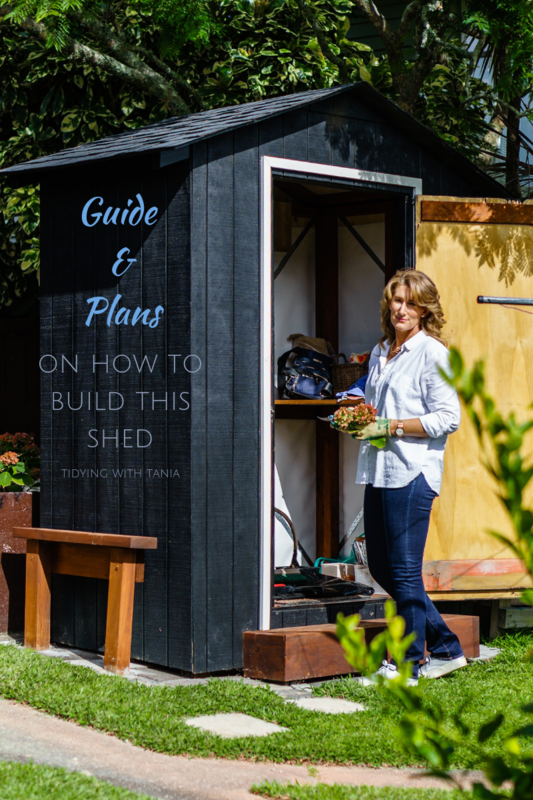 Don’t forget to grab the Guide and Plans, above if you are interested in building the shed. Feel free to ask any questions, we are happy to help. If you want to get my monthly newsletter with my top 5 favourites and the latest post, just sign up below, love to have you join the Tidies!! It was late March when we finally moved back into the renovated kitchen, I simply just put things into the new pantry in a similar way that I organised my old pantry. I figured that in the coming weeks I'd get things sorted and reorganised for the new pantry. Well it's now August and I still standing staring at my new pantry working out how I want to organise it. So I set myself the challenge of getting this pantry organised by the end of August. 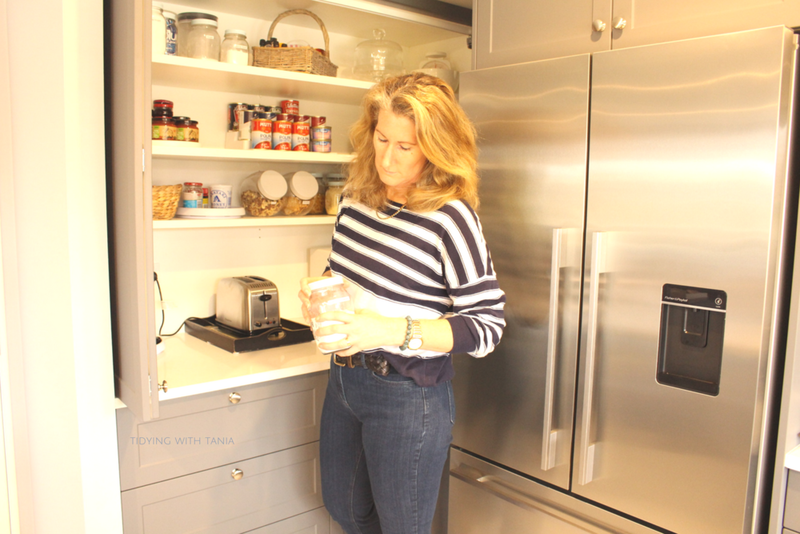 In my situation I had a number of different things scattered all around the kitchen that I wanted to bring into one place, such as drink bottles, cooking equipment, food storage containers, cook books etc. This means that at the moment I'm all over the kitchen getting bits and pieces and it feels very disorganised to me. The other issue is that our old pantry was a walk in pantry and our new one is different. We now have a bench top pantry along with three drawers and a corner cupboard. In fact there is a lot more space now however it is used in a different way. Added to this Pete and I have finally adjusted to cooking for two rather than four, so what we now have in our pantry and cupboards is different to what we had in the old pantry. The challenge I had was how to work out the best way to house everything that I wanted together in the new pantry. To be honest I have struggled with this organisation job, many a time I have been found just standing and staring at the new pantry, trying to figure out the best way to organise everything. Sometimes it just takes time to get things right and it can be a bit of a process of working out what works best for you. So let me take you through how I went about this organisation mission. As my regular readers know I love to use Pinterest to get ideas, it's a fabulous "visual google". I have a board all about Kitchen and Pantry Organisation in which I have got lots of great idea content. Fair to say that I have spent a wee bit of time searching through #pantryorganisation pins and got lots of inspiration.....like some of those pantries are off the charts!!! however I would question how practical they actually are. For me I love getting inspiration that helps to make things more functional at the same time as looking gorgeous darling! I have been inspired to try and use as much glass jars for storage as possible. In my old pantry, below, I got rid of a lot of old plastic containers, however as you can see in the picture below there are a few still to change over. 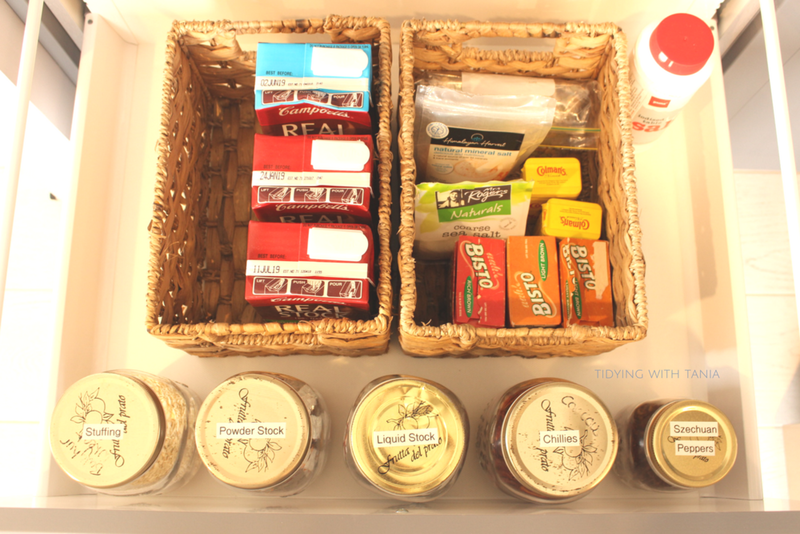 The main goal for the new pantry was to get everything in one place and make it really accessible. I do like to see as much of my pantry items as it's a really good way to be on top of what to buy. OK this is fancy way of saying pull everything out of the space and sort it out!. So that is just what I did, got everything out of the pantry as well as the items I had elsewhere in the kitchen that I wanted to house in the pantry. Once I had everything out on the bench tops I was able to go through and sort out what we actually needed and still used. This is also a good time to check the expiry dates and get rid of anything that has expired. Lastly I took advantage to give the pantry shelves, all the drawers and corner cupboard a clean. TIP: a simple clean up of a space can make it look a lot better and nicer to be in. So I've decluttered, cleaned and categorised everything, now the mission was to work out where to place them in the pantry. This is all about setting up good systems so you can keep your pantry organised all the time. And not just a one off burst of cleaning and sorting then back to a big mess again. Ok so how I do this in any space, is to work out what you use and how often, this will guide you to where and when you need to have the items and how easy it is to get to them. TIP: if it's not easy to get to, your system will not work and you'll get a mess pretty quickly. In my pantry I have the spaces for storage spread out between the shelves in the bench top pantry, three drawers below the bench and the corner cupboard which has two large shelves. The best access is the bench top shelves so I decided that I needed to put the items that we reach for daily on the first two shelves. In regards to the non food items I had already worked out the they are best housed in the corner cupboard as we only access these once a week or so. Then lastly the three drawers which are deep and wide and really accessible. The thing with the drawers is that you need to be able to see the items easily by looking down not straight ahead or up as in the pantry and I had the perfect solution for that, label the top of the jars. The actual bench top houses our smoothie machine, toaster (Pete loves his toast!) and the grotty old microwave, which still works fine and no sense in replacing just coz it looks ugly. What I did do though is put a tray on the top of the microwave and placed my two most used cookbooks there for easy reach! The true test of the kitchen pantry organisation is how the rest of the family like it and work with it. For me that's Pete, it's got to work for him too, so each time through the process of organising I'd check with him and reorganise. There were a few things I changed thanks to his suggestion. I'd totally recommend that you involve the members of your family in this process, this will really make it work well. 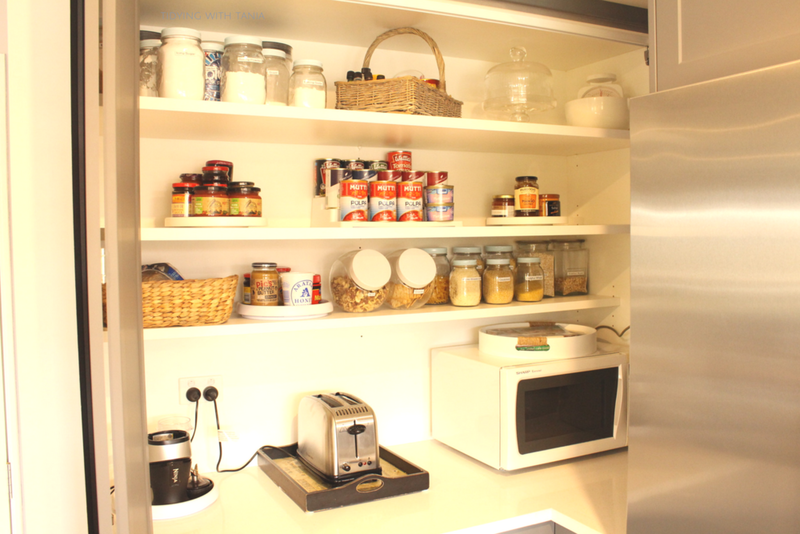 I am very pleased to say that this new pantry layout and system is working really well and best of all I have everything in the same area which is what I wanted. It's really simply, decluttered and easy to use, hmmm just given myself a pat on the back!! What do I need to fix the problem? If you have any tinned goods or dried goods that you are not using any more, donate them (as long as within expiry date). Most local supermarkets have a donation box. Also think about using refillables, (bring in your own containers) we are moving away as much as we can from plastic and packaging, it's a work in progress and I could and will do a post on this. 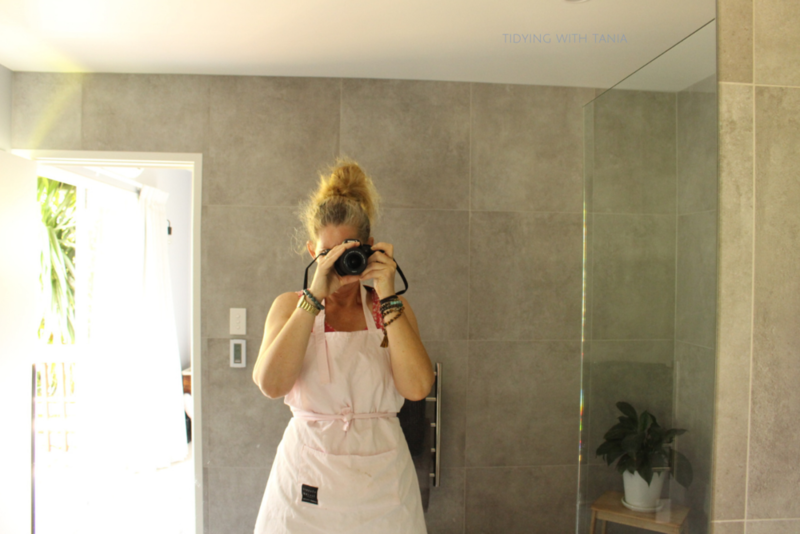 Here in my neighbourhood there are a couple of really good stores that provide great options for refillables, GoodFor is now located in Takapuna and has stores in Parnell and Ponsonby and The Source Bulk Foods NZ is located in Milford as well as Kumeu. There is also the long standing Bin Inn, which Pete and I used a lot when the kids were young and money was tight and it was not fashionable to be refilling.....funny how times change...however I totally support all ways to increase reuse, recycle and refill ...I mean our children's, children are depending on it! So that's me done, hope you found some good ideas and tips and as always I'd love to here from you about your pantry organisation. I will be doing more posts about other areas in the kitchen that I organise and will certainly be doing more about my reuse, recycle and refill journey, so make sure that you stay tuned by signing up to my newsletter, love to have you join us. One of our long term retirement goals is to go "tiny", get ourselves a Tiny home and enjoy the freedom that it gives you, so you can jump into the next adventurous stage of your life. However living tiny can be a bit scary so getting a trial run at it would be good. And that is just what we are doing over the next three months....we've going Tiny!, downsizing , whatever you like to call it. This came about due to our major house renovations and the need to actually stay in the home (renting just wasn't an option). We were fortunate to have a downstairs space, our entertainment room, that we could use to live in, approx 60sqm. So we have essentially downsized and moved into this area. So far it has been a very interesting and a surprisingly fun experience...3 months on it may not be as fun..time will tell. The first challenge was deciding on what to take. Actually it was more of what not to take as the restriction of space really forced you to think what was actually essential and what was a nice to have. So far this journey has taught me how little we actually need and use on a daily basis in comparison to the amount of stuff that we actually have. Yes a normal house would have all of these seperate however in our tiny space they are all in one, in other words they share the same space. This was the hardest area to work with as it is sooo small but needed a lot in it to make it functional. I started with the Bathroom, using a plant to divide the bathroom from the kitchen area. In this area I used a small corner table to store bathroom essentials, making sure that I used only exisiting storage and furniture. It's tight but all we need for two people. Under the sink I put the kitchen cleaning and towels etc on one side and the other the bathroom items. I had to sort out and clear out a lot of items from the actual kitchen and two bathrooms and decide what to take with us. The limitation of room simply forces you to be ruthless. I thought I was pretty good being clutter free but I have seriously ramped up that skill. The bench top space is very small but needed to have those things we use a lot. To help with space I corralled the toaster, jug,chopping boards and blender and beside the sink we have the dish rack!!! Yes there is no dishwasher well actually there is and it's me and Pete but no machine so the one thing I did purchase was a dish rack. I have to say the real blessing in this area was the laundry cupboard. I took all the non essential laundry items and stored them in the basement. This meant that I could use that space for a pantry and it works perfectly. However like all other spaces I had to seriously downsize the pantry contents. We have used Pete's beer fridge as our fridge with the Microwave on top and on top of that is all the laundry kit, again corralled. Out in the main area we got a large piece of wood and covered the pool table and created a kitchen island, now that was a genius move right there. I used a couple of shelves, one for the glasses and plates and the other for cooking equipment and other essential kitchen items. I have to say it all works really well. So boom that's the Kitchen, Laundry and Bathroom ! We have these two very ugly lazy boy chairs but boy they are the most comfortable chairs I have ever sat in. I have used a couple of nice throw rugs to disguise the ugliness, put a wee table in between them and that is the living and TV zone. Behind the chairs I have separated the areas with a small cabinet. This is now the dining room zone, use of a large rug and a small dinning table in the corner really helps to zone this space. Also in front of the "Kitchen island", I have put the hall table with pot plants, this makes the separation from the Kitchen zone and the dinning room. Oh and I told Pete that when we actually downsize we are taking those chairs!!! Can you ever describe a chair as heaven? This may well sound a bit silly however to make this space work for us and to ensure Pete's health and wellbeing, the ability to have a good reading area and more importantly his coffee machine was absolutely essential rather critical really!. It took me a bit of thinking to get the coffee station sorted...actually stumped me for a while, then I struck upon the idea of using the TV corner unit. The unit was going to be stored away and unlikely to be used again in the new lounge. So it was a great opportunity to recycle it. It fitted everything on it perfectly, like it was made to be a coffee station. I could even store the coffee and tea supplies in the wee cupboard. And next door to this I just set up his reading nook, using the piano area as a shelf. Ok ladys, I am sure that you would understand this, I like to have a nice space where I get ready in the morning. Now I did not think that I would be able to create what I term the "chicks zone". However there was an area in the corner of the room that has a large mirror and that inspired me to create my chick zone there. I used an old dresser that again was going to be put into storage. Placing my yummy pink sheepskin on the floor finished it off nicely. I really love this space and it's my wee sanctuary in the morning. I think it's now week three in the "tiny" space and I have to say it's surprisingly comfortable. Pete and I have got into our new routine of living in the confined space. You are close to each other a lot so it's a good thing that I love hanging out with him. Juggling the one sink in the morning is sometimes a bit of a battle as we both go to work at the same time. I do find it a bit annoying being constantly interrupted when at the sink!!! something I am working on!. Enjoy those things that bring you joy! My initial plan was to pack up most of the ornaments etc, however it was actually quicker for me to just take the items downstairs into the new space. I actually really enjoyed how I could make the areas familiar and nice with our things. I did have to select only those that I really liked, and that was in fact an easy job. Although we have managed to put a lot of furniture and things into our new "Tiny" space there is a lot in storage! Which makes me realise how much we do not use and question the need. To be honest I do not surround myself with a lot of clutter and living tiny has taught me how to focus in on what is actually really important and meaningful. I know that when it comes to moving back into the renovated area there will be big purges going on. The last note and one of the best is the significantly reduced cleaning that I need to do. It is bliss not have to clean such a big house. I am amazed at how quick I can wizz around and have the place clean. I can actually do all the zone cleaning in one go! However one thing that you learn quickly is that you can't just leave things lying around as there simply is no space, so you have to learn to put things away as soon as you finish with them. There are some members of the family who are still challenged by that. In the new year I will be doing another giveaway, something to help you keep your home clean and tidy consistently and with effective use of your time! Now that's a good new years goal!. Make sure you subscribe to my newsletter if you have not already so you can me in to win!. I hope you all have a fabulous Christmas and I'll see you all back in the new year. To be honest I was never that concerned about the state of affairs under my kitchen sink. Ok, there was a bit of a mess at times, it was a catch all for cloths, sponges, cleaners, buckets, brushes etc however on the whole I always found what I needed. Upon moving into our current home, now 5 years ago, the under sink area was pretty awful due to the age of the kitchen. There had been a number of leaks over the years so plenty of water stains, grim and no functional storage space at all. As I knew that I would not be getting to update the kitchen for some time , like 5 years, I wanted to do something with this space, making it functional and well, even a bit pretty!!! At time of moving into the house I just sort of threw everything under the sink. To get this space back in order the first thing I did, and this is actually rule # 1 with organising a space, was to clear out all the items. I threw out all the old sponges, the tiny bits of left over steelo, the dirty ice cream containers, stained tea towels, expired hand cream and old cleaning products. I keep the items that were still in ok condition and that I actually used, which surprisingly was not a lot. The next step was to decide what I actually wanted, essentially sorting out what I used in the kitchen that would be useful to be stored under the sink. I managed to narrow it down to few items!! I have to confess at this point I did a bit of a shopping trip to replace all my towels, sponges , gloves, and brushes....ohhh shame! It did mean that I could actually colour coordinate everything. So now that I had all the items that I needed to be stored under the sink, I had to work out how I was going to house everything. I grouped items together based on how I would use them, such as the cleaning cloths with the general cleaner. The rubber gloves with the scrubbers and sponges, watering bottles together. Then I worked out how often I would use the items and therefore where I would place them, e.g sponges, gloves and scrubbers within easy reach. I still had no storage at all so I decided to purchase some storage containers, measuring them first to ensure that they would fit into the space properly. I also shopped the house and found an old spice rack, which I put to great use on the inside of the cupboard door. Using two command hooks, I simply placed the small spice rack onto the hooks. A colour coordinated paper clip holds the gloves together so they can be hung onto a command hook too. I got a couple of tiny little plastic bins/buckets from the $2 Shop, that I put into the rack. 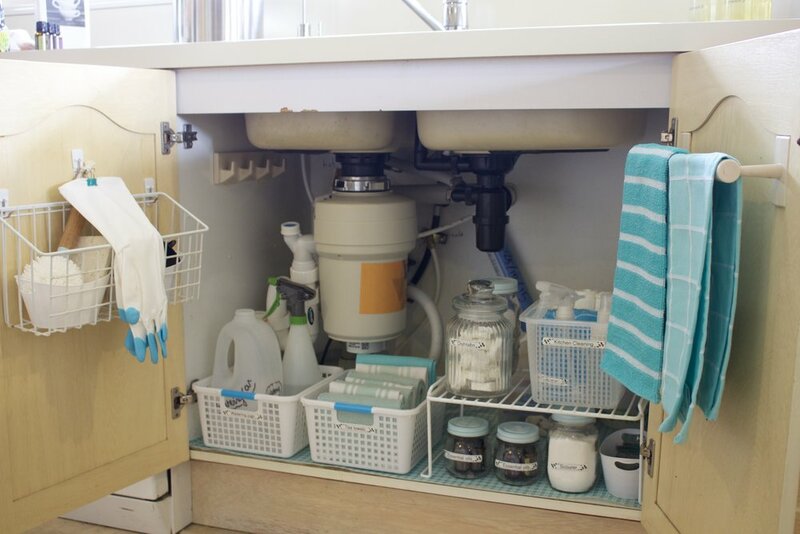 The perfect storage spot for the rubber gloves, sink plugs and scrubbers. Another storage option that I used was glass jars. Again, these were some that I had in the house and I was not using. Jars are great as you can see the products, so always know when you are running low. The jars store the Dishwash tabs, Baking Soda for the sink cleaner, essential oils and tea lights and of course they are labelled. To cover all the horrid water stains and years of grime, on the bottom of the cupboard I used a roll of non slip drawer liner. I just cut it to size and used double sided tape to hold it in place. I really loved how this worked out, makes the space look so new! And it's easy to keep clean. Finally, having sorted out my storage containers and what I needed to store. I set about laying them out in the cupboard, for me I wanted to get as much at the front as possible so they are easy to get to. At the front I placed the watering jugs and tea towels and then on the riser I put the dishtabs and cleaning container. All of these items I reach for daily and so they needed to be easily accessible. I put my essential oils under the riser as I do not need to access them every day. At the back of the cupboard I have the spare sponges and other items that I only need to access once a month or so. On the top of the bench I have the dishwash liquid, hand wash, dish brush and hand cream, all keep together for easy reach. So now this space works so well for me, everything is so easy to get to and because everything has its place it does not end up a big mess after a couple of months. So how is your space under the sink? Need a bit of attention? This could be a great wee project for you to kick into spring or autumn! If you like this post, I'd love you to subscribe below to my newsletters, where you receive even more awesome tips and ideas on organising around the home and garden. Plus special offers and discounts. It's easy as bro! just put your details in below and hit the subscribe button. What is a Command Centre? Generally these "command centres" are near where people go to when entering the house, mainly the kitchen or dining space. We have used a an area in the kitchen bench for a few years now and I have recently streamlined it as we slowly adjust from a four to two person household. I have kept it as simple as possible, only housing the items we do use on a daily basis. I have created three zones i) bag zone ii) mail and calendar zone iii) Central zone. We both use backpacks, daily, during the week and they need to be easily housed. There was no way that I could get Mr P to put away his backpack in a cupboard, and in fact it mostly got dumped on the floor by the kitchen bench. So in the end I came up with a very simple and easy solution by placing two chairs side by side on which we place our bags on when we come home. These bags always stay on these chairs. We always know where they are. There is also just enough space to place my weekend shopper on the chair. I place my handbag in the tray in the central zone as it fits perfectly. Above the bag zone, on the wall, there is a calendar (my Mum makes one each year for us from her beautiful photos she takes) and a mail board where any mail that comes into the home is placed. Next to the bag zone and just under mail and calendar zone I have placed a wooden tray. In the wooden tray I have got a folder divider and a very small bowl. The folder divider holds the pens, note book folder, Home folder and RnR folder. The small bowl holds keys, it's only just big enough to hold the key and no more and when the phones are not on charge they are placed here. The notebook compendium I have had for a while and got it from Kikki-K . They do not seem to have it in stock anymore however still have a couple of options here. The most successful thing about this command centre is that I have developed it just for us. I thought about what are the most important things that we need to access and how can I make it easy for Mr P who still likes to dump. As we walk in the door we naturally go over to the chairs, dump our back packs, keys and cells, sort the mail. I have created functional and obvious space that works well with how we live and does not require us to change a lot. I also believe by keeping the spaces small and specific and no room to put other items, it keeps it clear of clutter gathering. That's not to say that from time to time things do gather however it's easy to clear out the space and maintain a nice tidy area. In my previous organising and planning posts I have taken your through how I created our Household folder, Budget folder and Recipe folder. We also have a RnR folder (Rest and Recreation), Mr P is in charge of this and it is for planning our mini breaks and other such exciting adventures. I just cut the card stock to size, stuck the gold stickers on and then placed the sheet into the shelve of the folder. I also placed the same card on the spine and a plain type paper for the back. Very simple, fun and good way to take a boring folder and make it look interesting. The best part of this was how I managed to match the two folders in the command centre to the notebook compendium, if you are stationery obsessed like me you will appreciate this. So how is your "drop zone" ? Is it the entire kitchen bench top? or the kitchen table? Or just anywhere where there is clear space? Maybe try out some of these ideas I shared, or take inspiration to make it meet your needs, either way have a go and you might be surprised what you achieve. Now, for those of you that read along with me and my posts, you will have picked up that Pete and I are slowly renovating and redecorating our 1960s cedar and block home. This is a long process, so far it has been 5 years. There is a lot to do, both inside and out. There are areas of the house that are somewhat outdated and not really fit for purpose and we have to make do until they are renovated. Point in question is our bedroom wardrobe. This wardrobe is actually in our ensuite...yes that is right, our ensuite, and it is all original and I mean 1960 original which is when the house was built. We are making do with this area as it will be renovated at the end of the year. In the meantime I have had to work hard on the wardrobe to get it usable, one because it's in a bathroom and two because it is so small for two people. The wardrobe space is still very tight however now at least I have made the most of all space available and access to the clothes is a lot easier. So I thought I would share with you what I have done, so if you have a very small wardrobe and want to get more space, this post may be worth a read. We needed to be able to house all our clothes (except for jackets and Pete's work shoes). We had to reduce the amount of moisture that was getting in. I mean who does that!!!! 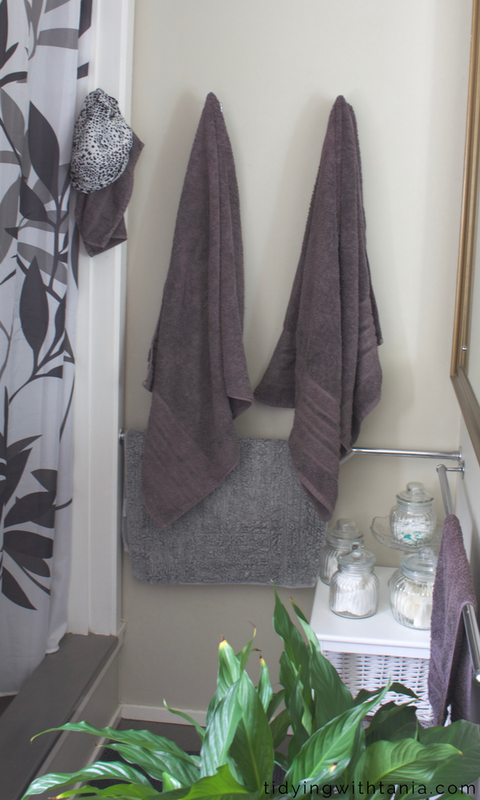 put a wardrobe into a bathroom space!!!! Yes, you know me there needs to be a plan. This one was pretty simple, just do some research, get the equipment needed, sort it and refit it out. However there were some challenges. The biggest challenge was how get a lot of drawer space at the same time as increasing the hanging capacity. The wardrobe had one metal rail with a wooden shelf above it. It also had wasted and difficult space in the middle of the wardrobe because of the sliding doors. I got my google fingers going and came across an number ideas in YouTube and good old Pinterest. I found this great tutorial from Engineer your Space which gave me the idea to replace the sliding doors with curtains and create another hanging rod by moving up the existing rod and shelf. However I still needed more storage space and thought about how I can effectively use all the space within the wardrobe. One particularly good idea came to me was to use an old duchess that was in my daughters room (she has left home and didn't need it). A wee fact, the duchess was my original one from when I was a child, which is kind of special. I also brought two hanging shelves and reused a 4tier cube shelf that was no longer being used from my son's room. The coat hangers were an important part of the plan as I needed to replace them all with the space saver coat hangers, these velvet ones from Briscoes are the best and the clothes do not slip off. Firstly I cleared out everything from the wardrobe and did a full purge, both my clothes and Pete's. I am getting pretty good at decluttering and do not hang onto items that I do not use much. I have actually discovered over the years that you wear probably about 20% of your clothes 90% of the time. I am now down to that 20% and it does feel great because trying to figure out what to wear is so easy. 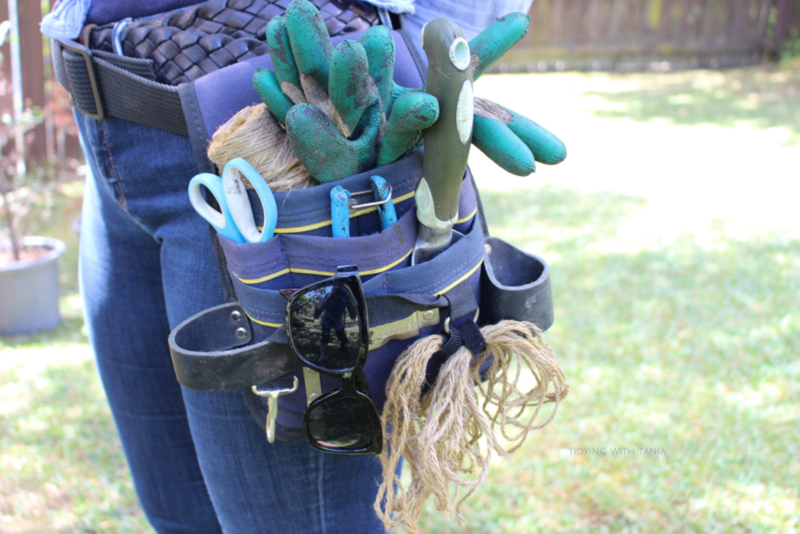 I am lucky with Pete, he is a Tradie so only has his work gear and pretty much just jeans, t's and shirts so his clothes don't take up a lot of space. The next step was to map out how to set up all the rails and storage. You do need to measure each area and work out what will fit best and it took me a few goes to get this right. It is very helpful to do this first as it really helps when you put it all together. Pete moved the clothes rod and shelf up for me, just as shown in the Engineer your Space video, link above. I purchased a piece of aluminium tubing and chain to create another rail. This allowed me to hang two tiers of clothes where before I could only hang one. I placed a 4 tier cube shelf on its side on the top shelf. This not only provided more "drawers" but also provided a space to put my shoes. With my duchess, I did give it a bit of spruce up. As it was already a bit knocked around I just distressed it a little more by sanding it on the edges and the handles. I did a quick once over with the sander on the top and front, then just used a sealant spray which I got from the local hardware store. I have to say I was actually really pleased with how it came up. It was also really cool to be able to use my old duchess again. I got an old cushion cover, put a little bit of padding in it and placed on the top of the duchess. This is where I put my everyday jewellery, it's perfect and easy to get to. I placed the duchess in the middle of the wardrobe and put the hanging shelves above it, this was an excellent way to fill dead vertical space. All the longer clothes are hung to the left of the duchess and Pete's shirts and trousers. To house his work clothes I got a basket and this sits on the floor under his hanging clothes. It works well as its stores his work trousers and tops. A wee added bonus was the area to hang my scarf collection. I used the chain that held the second rail to wrap my scarves around and worked perfectly as a scarf hanger. The last thing I did was to hang the curtains. I had a brain wave and came up with the idea to use shower curtains to help keep the moisture out of the wardrobe. So I got two shower curtains and essentially hung them up as you would in the shower. I did make sure that I hung them on the inside of the frame so there was full cover over the clothes. As the curtains were not actually long enough I just sewed on a piece of cotton material onto the bottom, matching colour of course. I am amazed at how well this works. It's really easy to access the clothes and they do hold out the moisture which is really great. So there you have it, a "make do" wardrobe which houses all our clothes. It works really well and does stop me from buying clothes as there is really no room. If I want something new I have to let something go. I am however very excited to plan my new big wall to wall wardrobe when we do the renovation and this "make do" one has given me some great learnings and ideas for the new one. Are you happy with your wardrobe? Do you want to make some changes? Have you already got your dream wardrobe? Love to hear from you on any wardrobes stories. Have a great week everyone, and see you at the next post. If you don't already get my updates via email, just subscribe below and I will let you know when my latest blog has been posted. Don't forget to follow me on social media, links below.